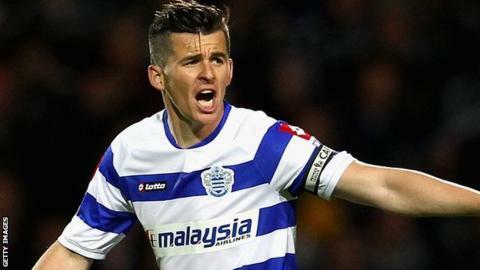 Joey Barton has completed his season-long loan move to Marseille from Queens Park Rangers, while Stephane Mbia has moved in the opposite direction. Midfielder Barton, who turns 30 on 2 September, tweeted: "I am now a player for L'OM. What a birthday present! Cannot wait to get going." Cameroon international Mbia, 26, can play in defence or midfield and has signed a two-year deal at Loftus Road. "He is a big, strong guy with a strong mentality," said QPR boss Mark Hughes. "He wants to win and is the type of player I want at the club. "We have been talking about getting a centre back and he is in my mind for that role, but he is just as adept in midfield and I wouldn't have any worries about playing him in either position." Mbia said: "It was an easy decision because this is an important move for my career. "It has always been a dream of mine to play in the Premier League, which I believe is the best league in the world. "The ambitions of the club and what the board of directors and the manager want to achieve here excites me greatly." The arrival of Mbia follows QPR's deadline day signing of Sam Magri, who joined on a two-year deal from Portsmouth. Pompey agreed to release the 18-year-old centre-half from the final year of his contract at Fratton Park so that he could join the Premier League club. The England youth international made one senior appearance for his hometown club and will go straight into the Hoops' development squad.